Planning a shopping trip? Take a break from the big box stores and take your shopping lists to your favorite local shops which are likely owned by someone in your own community. Reminder – the Saturday after Thanksgiving, otherwise known as “Small Business Saturday,” marks the annual shopping tradition that supports these small, locally owned businesses and celebrate communities everywhere. So, grab a friend or family member and enjoy discovering your own local treasures! Whether you have a student-athlete in your home or not, chances are you know someone who does. One great way to give back to your community that involves very little time and investment is to become a sponsor for a local sports team. Are the Arts more your scene? Sponsor your high school or community theatre’s upcoming production. Whatever your passion, there are local organizations and events that need your financial support. Volunteerism is a great way to put your passion into action, and feel great doing it. While time and a little internet research can uncover a variety of volunteer opportunities, you can narrow down your list by selecting an organization that needs volunteers with your skillset, or by choosing an organization that supports a cause you care about. Help build a better community by rolling up your sleeves and putting yourself to work! If you are physically able, why not use your time and energy to get involved in construction projects in your community? Try getting your hands dirty in a community garden, grabbing a hard hat to help build a home, or channeling your inner artist to help paint a mural. Employee volunteerism is important to many companies and organizations, so consider contacting your own HR department to find out ways your employer is involved with your local community. Some employers even offer incentives for volunteering on your own time, or even allow you to volunteer on their clock. Here at Inlanta Mortgage, giving back to our local community is an integral part of our culture and is ingrained in our mission and vision. In fact, Inlanta contributes to our communities year-round! Some of our favorite non-profit organizations include the Cancer Research Institute, the Lombardi Walk/Run to Tackle Cancer, the American Red Cross, the Bryon Riesch Paralysis Foundation, the United Performing Arts Fund, the local Pewaukee Food Pantry, and more. 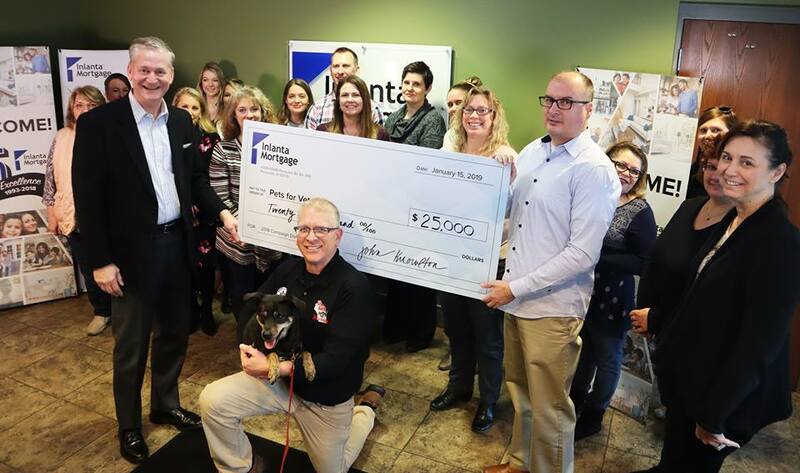 This year, we’ve partnered with Pets for Vets, an organization that pairs returning vets with shelter dogs, and are making a donation to their organization with every loan closing through the end of the year. 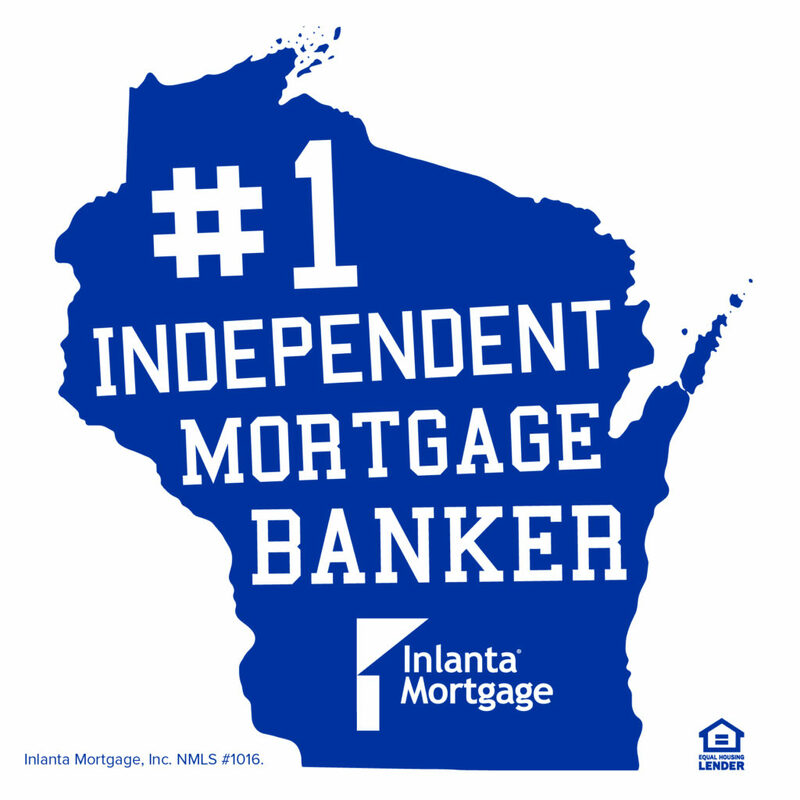 Inlanta Mortgage, Inc. has been named the #1 Wisconsin-based independent mortgage banker in Wisconsin! Inlanta Mortgage has proudly served Wisconsin residents for the past 25 years. Their dedication to Wisconsin families shows in the 2016 data collected through the Home Mortgage Disclosure Act (HMDA). Of all Wisconsin-based, independent mortgage bankers, Inlanta closed the highest number of loans (units) in the state of Wisconsin. Inlanta received this news as they begin prepping for 2018, which marks their 25th anniversary of providing Loans for Your Dreams®. “We planted our roots here in Wisconsin 25 years ago and have no plans of relocating our headquarters. One of the reasons Wisconsin homeowners trust Inlanta Mortgage with their home financing needs is because they know we are a locally-owned and operated company,” said Chris Knowlton, chief information officer of Inlanta Mortgage. Inlanta Mortgage continually seeks branch managers and loan officers who want to grow their business. To learn about opportunities in other locations, visit www.inlantapartners.com, call 262-439-4260, or email partners@inlanta.com. The holidays, especially Thanksgiving, are a time for us to pause and reflect on all of the good fortune life has bestowed upon us. We all have something we can be grateful for, and what better way to express our gratitude than to pay it forward to our communities. 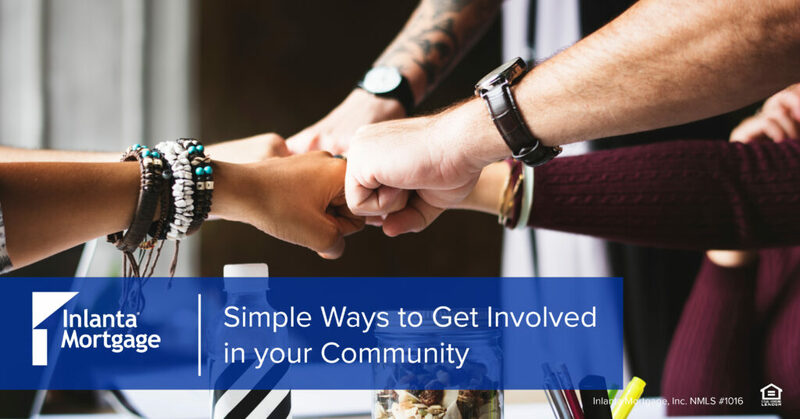 We’ve compiled 5 ways you can give back to your community. Planning a shopping trip? Rather than buying your shopping at a big box store, support your local businesses and your community by taking your holiday shopping lists to your favorite local shops. The Saturday after Thanksgiving, otherwise known as Small Business Saturday, commemorates the annual shopping tradition made to support small businesses and celebrate communities everywhere. So, grab a friend or family member this Saturday and enjoy! Whether you have a student-athlete in your home or not, chances are you know someone who does. One great way to give back to your community that involves very little time and investment is to become a sponsor for a local sports team. Are the Arts more your scene? Sponsor your high school or community theatre’s upcoming production. Whatever you are passionate about, there are local organizations and events that need your financial support. Volunteering in your local community is a great way to give back and feel great. While time and a little internet research will likely give you a variety of volunteer opportunities to choose from, you can narrow down your options by selecting a prospect that involves offering up your own set of skills, or, choose an organization that supports a specific cause you care about. Help build a better community by rolling up your sleeves and putting yourself to work! If you are physically able, why not offer your time and energy to get involved in construction projects within your community. Try getting your hands dirty in a community garden, grabbing a hard hat to help build a home, or channeling your inner artist to help paint a mural. Employee volunteerism is important to a lot of companies and organizations, so consider contacting your own HR department to find out ways your employer is involved with giving back to your local community. Some employers even offer incentives for giving back and volunteering on your own time. Here at Inlanta Mortgage, serving others and giving back to our local community is very important to us. In fact, Inlanta contributes to our communities year-round! Some of our favorite philanthropic charities that we give back to include the Cancer Research Institute, the Lombardi Walk/Run to Tackle Cancer, the American Red Cross, the Bryon Riesch Paralysis Foundation, the United Performing Arts Fund, the local Pewaukee Food Pantry, and more. Inlanta just recently wrapped up our 2017 Hunger Games food drive to help support our local food pantry, collecting 2,984 items total to help fight hunger and feed our community! Inlanta is also planning to hold our second blood drive for the American Red Cross this December and is looking forward to planning other various philanthropic initiatives in 2018. On Saturday, July 23rd, a group of Inlanta employees participated in the Lombardi Walk/Run to Tackle Cancer in Milwaukee, Wisconsin. This annual fundraiser aids in cancer research and allows the Vince Lombardi Cancer Foundation and Aurora Cancer Care to provide better treatments to those in need. Sporting their Team Inlanta shirts, our team of 24 – consisting of Inlanta employees and their families and friends – endured the sweltering heat to participate in the event as a show of support for Joe Ramis, Inlanta’s senior vice president of loan production, who is currently going through cancer treatments. Our team reported having a great day with their colleagues supporting an incredible cause. Liz Labodda from Accounting, who is an avid runner, even took home the first place medal for runners in her age group! Over the past few years, Inlanta has seen many of those we care about affected by this terrible disease, both employees and their loved ones. As a company, we have made it our philanthropic mission to help find a cure for cancer and show support for our Inlanta family members. We accomplish this by participating in events like the Lombardi Walk/Run to Tackle Cancer and hosting our own internal fundraisers to raise money for cancer research. Team Inlanta had a goal of raising $3,000 to help tackle cancer. With a company match, our employees were able to raise $8,080 for the Lombardi Walk/Run to Tackle Cancer, pushing Inlanta to the #5 fundraising team for the event. We are grateful to work with so many kindhearted and giving individuals, and we hope that our contributions will bring cancer researchers one step closer to finding a cure. Learn more about the Lombardi Walk/Run to Tackle Cancer here. Congratulations to Kurt Waltenberger, a mortgage specialist at our Hales Corners, Wisconsin office, who has been honored with the 2015 Ambassador of the Year Award by the Muskego Area Chamber of Commerce. Waltenberger received the award at the Muskego State of the City breakfast on Wednesday, March 2nd. In addition to Ambassador of the Year, the Muskego Area Chamber of Commerce also gave out awards for Volunteer of the Year, and Board Member of the Year, as well as announced scholarship winners and Business of the Year nominees. According to the Muskego Chamber of Commerce’s website, “The mission of the Ambassador committee is to serve as direct representatives of the Chamber, fostering growth, and goodwill by engaging the business community.” The Ambassador of the Year award is given to one ambassador as recognition for their contributions in the last year. “I am honored to receive the Ambassador of the Year award. I cherish the friendships I have made and truly appreciate the warm sense of community that being a part of this wonderful organization brings,” said Waltenberger. Waltenberger joined the Muskego Area Chamber of Commerce to stay involved in his community after the chamber of commerce in his hometown of Wind Lake, Wisconsin disbanded. As he got more involved in the Chamber and became an advocate for his community, he was asked to be a Chamber Ambassador. He subsequently lobbied to expand the Chamber’s footprint to include the Wind Lake area businesses. His idea was welcomed, and he spearheaded the movement to get Wind Lake included with the Chamber. He personally approached his town board to get endorsed and recruited a number of businesses to join the Chamber. He has attended, helped organize, and sponsored many events in the community, and they are now expanding their community guide distribution to include Wind Lake and Big Bend. The Brookfield West office has been busy collecting toys for the Children’s Hospital of Wisconsin during their 5th Annual Toy Drive. Each year the ladies and gentlemen of this branch reach out to customers, friends, fellow employees and vendors to donate a new, unwrapped toy for children at the hospital. The pictures above showcase the collection of toys so far. One vendor, SS Speedy (pictured in bottom right), shared a quick picture of themselves with their generous contribution to the Toy Drive. The Brookfield West office is still collecting toys through this Friday, December 19th. They are also welcoming cash donations, which they will use to purchase additional toys. If you have any questions, please call the Brookfield West office at 262-439-4257. All of us at Inlanta Mortgage wish you a safe and happy Holiday Season! Last year, Inlanta Mortgage celebrated its 20th Anniversary. Inlanta Mortgage is a growing mortgage banking firm committed to quality mortgage lending, ethical operations and strong customer service. It’s Christmas Time in Oconomowoc, Wisconsin! Tomorrow at the Inlanta Mortgage Oconomowoc, Wisconsin office branch manager Penny Charlson is welcoming children to her office to decorate gingerbread houses. As you can see from the picture, Penny has been busy preparing the gingerbread houses for the children. Her gingerbread decorating event is one of many scheduled at the The Avenue Square Mall in downtown Oconomowoc where Penny’s mortgage office is located. The public is invited to join businesses in the Avenue Square Mall for a building-wide Open House Event scheduled from 10am-4:00pm. Visit Penny tomorrow during her Open House event or contact her at 262-674-4663 or online www.pcharlson.com. Penny Charlson NMLS# 285422. Inlanta Mortgage is proud to announce its partnership with the Packers Radio Network. In an effort to reach more home owners and home buyers in the state of Wisconsin, Inlanta will be sponsoring radio network programming beginning November 9th. Inlanta Mortgage is a a Wisconsin based mortgage banking company offering home financing solutions such as FHA, VA, USDA, conventional and jumbo purchase and refinance loans. Licensed Inlanta loan officers personally consult with people looking to buy or refinance a home to determine the loan program best suited to their needs. You can find a mortgage loan officer using our branch locator or apply now and we will connect you with a loan officer directly. The Packers Radio Network, on WTMJ, has been broadcasting the team’s games since 1929. Inlanta Mortgage is officially a sponsor of the Packers Radio Network and will be included in upcoming broadcasts. Radio spots from Inlanta Mortgage will begin airing on radio stations statewide beginning on Sunday, November 9, 2014, which marks the Packers’ home game versus the Chicago Bears.